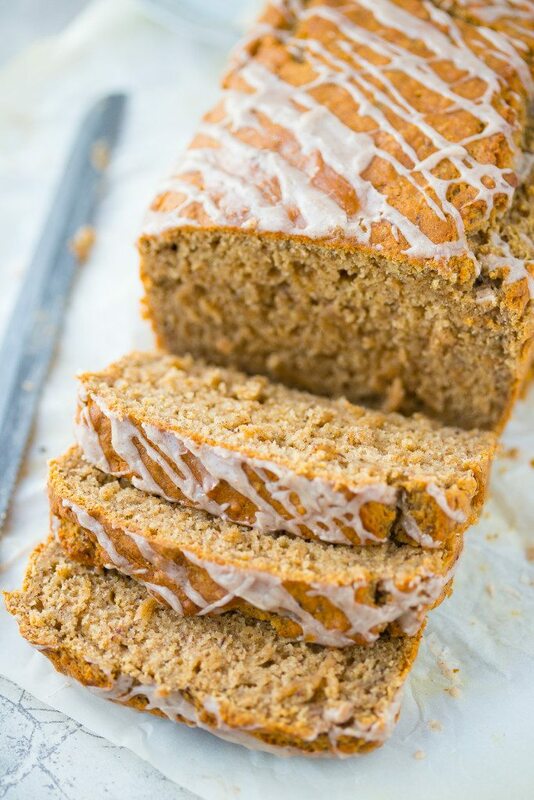 This chia and chai breakfast bread is a seductively spiced, no-knead, easy to make bread recipe that’s the perfect quick breakfast on a crisp fall morning! I know it’s technically not fall yet, but let’s pretend, shall we? I’m so ready for pumpkin everything, apple cider candles, and giant bowls of soup simmering away on the stove. Call me cuckoo, but I’m longing for comfort, a sweet escape, and Halloween weekend on ABC family. The other day I took a chance, after being unimpressed by their beverages on two separate occasions, and stopped by a local coffee shop hoping above hopes that they would finally make me a decent cup of coffee. Eeeek! I found a winner! Have y’all ever had the pleasure of enjoying a Dirty Chai Latte? Ugh. It’s like instant ecstasy. For those not in the know, a dirty chai is nothing more than chai tea with an added shot of espresso. I’ve always wanted to order chai teas at coffee shops before, but I also felt like a bobo going to a coffee shop and not ordering coffee, ya know? I just didn’t see the point? Anyway, so the first thing I saw was a chalk board with the giant words, “Dirty Chai” scribbled across it, and I just felt as if it were calling my name. After the first sip, I cuddled it close and it started whispering sweet nothings in my ear. I first made this chia and chai breakfast bread several months ago, but I ended up losing all of the photos for it when my hard drive crashed so I was never able to post the recipe. 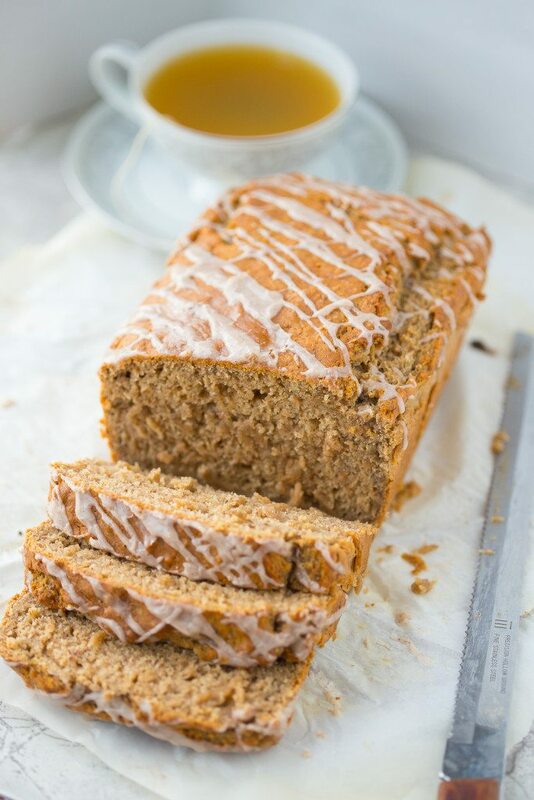 Sipping on that dirty chai latte made the sweet memories of this luscious bread tingle my tastebuds, and I knew I had to make it again for y’all. 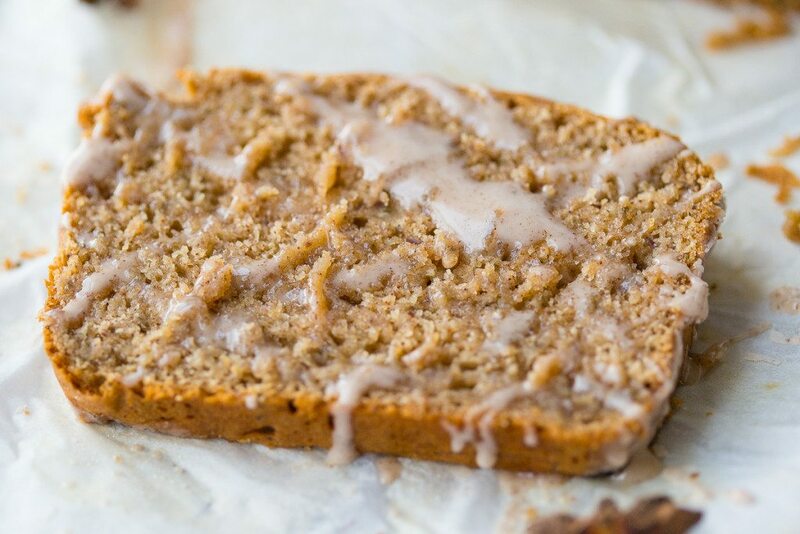 This breakfast bread is crazy easy to make, and there is no kneading involved! In fact, you don’t need anything other than the ingredients, two bowls, a whisk, spatula, parchment, and a bread pan. And omg, y’all, the chai tea drizzle?!? I want to slurp it up like the little piggy boy on a Christmas Carol. 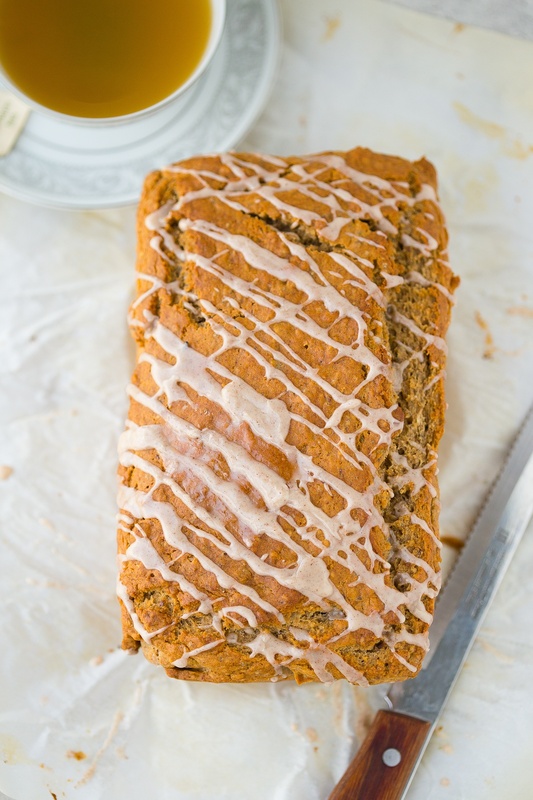 This recipe was adapted from my Clementine and Chia Seed Breakfast Bread, and like that recipe, it didn’t last long in our house. Owen finished the first half of his slice the other morning and kept repeating, “More, more. More peas.” over and over again while pointing his teensy finger at his empty plate until I fulfilled his command. Another thing about this bread is that there really aren’t any crazy ingredients other than maybe the chia seeds? But honestly how hard to find are chia seeds nowadays anyway? They’re everwhere, and if I can find them in our little podunk grocery store then I’m sure y’all shouldn’t have any problems either. There is one teensy pinch of cardamom that is called for in the glaze recipe, but that’s totally optional. 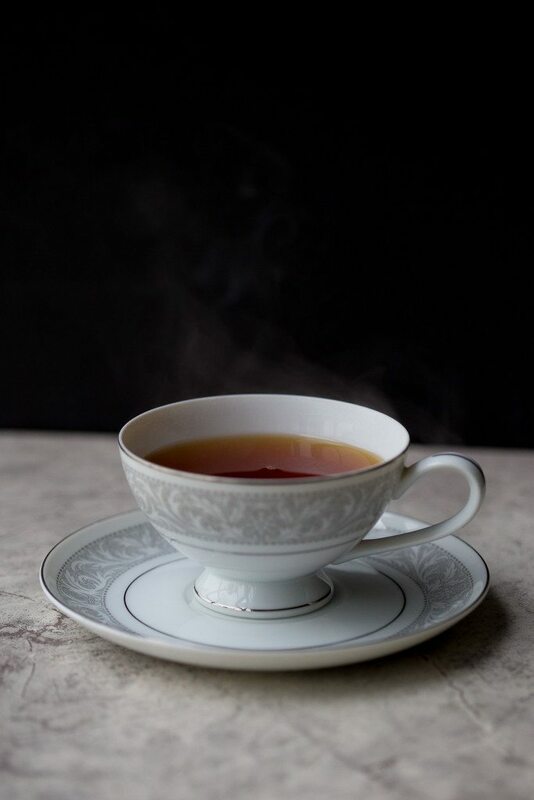 Cardamom is crazy expensive, and the only reason I even have it in my spice cabinet is because I tried my hand at making homemade chai tea powder not too long ago. Ok, I lie, it was totally over a year ago I tried to make that tea mix, but I’m not getting rid of a jar of spices that I paid close to $15 for because “they” say spices don’t last long. It still tastes fine to me. Shrugs. 2 cups unbleached all-purpose flour let me know if you try Gluten-free AP flour! Preheat oven to 375 degrees (F) and line a bread pan with parchment paper, leaving some hanging over the sides for easy removal. Set aside. In a large bowl, whisk together chia seeds, 1/2 cup brewed chai tea and milk then set aside for 10 minutes to allow the chia seeds to gel. In the meantime, whisk together flours, cinnamon, cardamom, allspice, ginger, baking powder, baking soda and salt until all ingredients are evenly distributed. Stir the coconut oil, applesauce, vanilla, and sugar into the chia seed mixture until well combined. Add the dry ingredients into the wet and gently fold or stir until just combined and there is no flour left. Pour the batter into the prepared bread pan and bake on the middle rack for 1 hour or until golden brown and cooked through. Allow the breakfast bread to cool in the pan for 10 minutes then gently lift out of the pan and transfer to a cooling rack and allow to cool completely to the touch. Stir together the glaze ingredients until well combined then drizzle over the bread. Owen's Barnyard Birthday Bash and a Pigs In Mud Cake! Previous PostPrevious Owen’s Barnyard Birthday Bash and a Pigs In Mud Cake! This looks incredible. 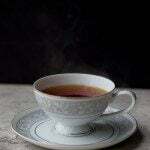 I have never ordered Chai tea out either–want to but coffee ultimately wins out for me! This looks insanely delicious! That sauce!!! OMG, what a great idea to use chai tea. The perfect fall treat! I can imagine how good this is going to make the kitchen smell! It seems so easy to make, no kneading. Love it! I like that you added chia. Chia and chai – what a great combination! And what a beautiful loaf this recipe yields. Thank you for sharing! I bet this smells so good and fragrant when its baking, I love chai, great idea! Wow, Amber! This looks fantastic! 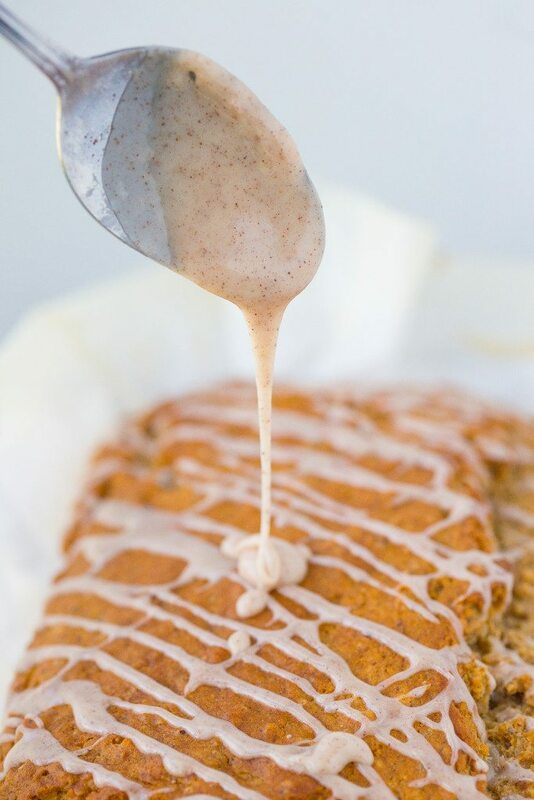 I love chai in baked goods, so this sounds right up my alley! I’m not very good with the oven yet. Dirty Chia sounds very interesting as well. I’ll give it a go with the expresso next tim. Dirty chais are a life changer, for sure! This bread is super easy to make so let me know if you try it! HOW DID I MISS THIS POST!? HOLY COW! I need a loaf of this in my face, yesterday!